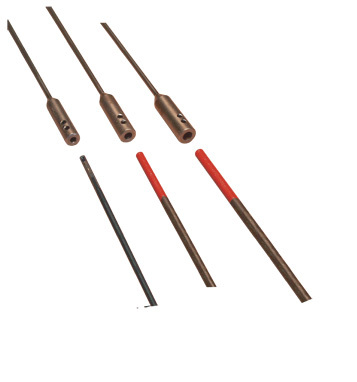 Our EXT series of drill bit extensions are designed for a variety of unique drilling situations. They are designed to handle high torque loads, yet still allow needed flexibility for better control. These extensions are designed to handle the most common shank sizes of flexible drill bits used in wire installation: 3/16", 1/4" and 5/16". The EXT series enables the installer to drill through top and bottom plates and multiple fire blocks from the same entry point, making a two story (or beyond) retrofit installation quick and easy. Simply determine the length of extension needed for the operation, determine the shank size of the drill bit (the end that chucks into your drill), tighten the set screws to secure the bit to the extension, and you’re ready to go. (Note: As with any long bit drilling situation, where the bit can be unwieldy, we also recommend our AT-7 drill bit directional tool for stability and control. See page 25). Our EXT extension series comes in several lengths and configurations to customize your unique drilling situations. A hex wrench for the set screws is included. Fits most standard shaft sizes.